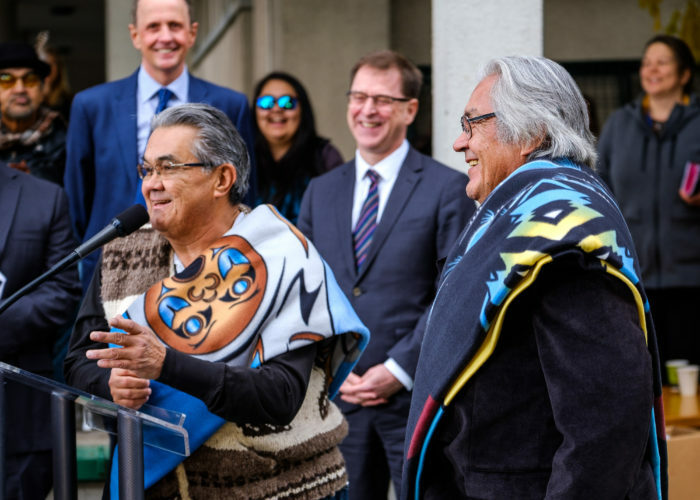 The Crossing Cultures and Healing Pole now stands outside of the B.C. Ministry of Health’s headquarters on Blanshard Street. The pole was carved by Tom and Perry LaFortune last summer outside of the Royal B.C. Museum, where members of the public were invited to observe the process and ask questions. The seven-and-a-half metre pole was officially unveiled in late November. Tom LaFortune explained in an earlier interview that the pole was meant to honour their late mother, who survived residential school, and all mothers who have been affected by the residential school system. On the top of the pole is a raven to pass the messages along, while a rope ties all of the figures together. The totem was carved as the result of a partnership between the Royal B.C. Museum, the Ministry of Health and the Songhees and Esquimalt Nations. The cedar log used was donated by TimberWest. Health Minister Adrian Dix said he sees the pole as a symbol and reminder of the ministry’s commitment to cultural safety and understanding. “Throughout the carving process this summer, there was an excellent learning opportunity for the public to witness First Nations cultural practices,” he said in a statement.